Note: The following post was written by Dr. Richard Belcher, who received his M.Div. at Covenant Theological Seminary and his Th.D. from Concordia Seminary. He is a retired professor of Bible, Theology, Greek, and Preaching at Columbia Bible College (now Columbia International University) in Columbia, South Carolina. By God’s grace he has been privileged to serve for over fifty years as a pastor and in the public ministry of the Word. I will not try to summarize all we have covered in our first three articles on Finney’s theology. The reader should have gotten the message by now that Finney was not orthodox in his theology. We now cover some further areas, and, sadly, the story is the same. Finney begins by telling us what the doctrine of election is not, but in reading this material one must remember his definitions of the doctrines already covered. Election is not that anyone is chosen for salvation without repentance or faith or sanctification or regeneration. Neither is election saying that a person can be saved without perseverance to the end of his life. Again, it is not that anyone is saved, because of foreseen merits or good works. It is not that God shows partiality to any man, that is, preferring one above another without any good or sufficient reason. It is not that election poses any obstacle to the non-elect and their salvation. Election is, according to Finney, that God elected men on the condition of their foreseen repentance, faith and perseverance. God foresaw that He would be able to secure their repentance, faith and perseverance, and on that basis He chose them. God is ready to save all, but He foresees whom He can secure and whom He cannot secure because of their willful and persevering unbelief. Which is to say, again, that God foresaw some could be induced to repent and believe the gospel and others could not, and those who He foresaw able for Him to secure, He elected them to salvation. Finney says further that God has done the best He could for the inhabitants of the earth, as He has thrown the responsibility of men being saved completely upon themselves – the whole of salvation is suspended upon the terms to which men are perfectly able to give their consent and lay hold on eternal life. There is no more that God can do for sinners, than they will do for themselves. He says again that the sinner’s salvation or damnation is as absolutely suspended upon his own choice, as if God neither knew nor designed anything about it. Thus, this seems not to be even a usual synergism – God and man. But this is a monergism of man alone in the securing of salvation. It is not God and man cooperating in salvation, but it is God held captive till man decides he will submit to the law to keep it perfectly. Again, Finney begins with what reprobation is not. Reprobation is not the ultimate end of God in the creation of a person. It is not that God has created any man for damnation. Man is only sent to hell for his own voluntary wickedness. Again, as election is the responsibility of every man, so is his reprobation. Nothing keeps a man from salvation but his own perseverance in sin. Reprobation is that certain individuals are in the fixed purpose of God cast away, rejected and lost, but that fixed purpose of God is not fixed by God, but by man himself – because of his foreseen wickedness. God both knows and designs their reprobation, because of this foreseen wickedness. If God purposes to save the elect upon their foreseen faith and repentance, it must be also that He purposes to cast away the wicked for their foreseen wickedness, as well. God prefers the salvation of the reprobate, if they could be induced to obey Him – but their foreseen wickedness and rebellion against God has already purposed them to be cast off forever. Sinners are not reprobated because God has any thirst for their destruction, nor because of any partiality in God, nor because of any lack of desire on God’s part to save them. Sinners are reprobated for their foreseen iniquities – they are seen by God from eternity past to be unwilling to be saved on God’s terms – submission to His law. They were seen by God from eternity past to defeat all the efforts that God could wisely use for their salvation. God has tried many means to save them, but they have refused. Divine Sovereignty, Finney says, does not mean that God wills or acts arbitrarily without good reasons. Sovereignty is the independence of God’s will in consulting His own intelligence and discretion in the selection of His end and the means of accomplishing that end in this world. It is the infinite benevolence of God directed by infinite knowledge – God consults only Himself – He consults no one but His intelligence. It is His infinite knowledge that enables Him to select an end and means that should consist with and include the perfect freedom of moral agents. It is God laying His plans in accordance with how His foreknowledge tells Him that men will act. Finney says our reason affirms that God wills as He does only upon condition that His infinite intelligence affirms that such willing is intrinsically right and therefore He ought to will or command just what He does. Finney says that God claims that He is sovereign in the following manner. He claims that His end was chosen and the means were decided upon, when no one but He existed and there was no one else for Him to consult. Even creation and providence are only the results and the carrying out of His plans, which have been settled from eternity past. The law of benevolence [something quite primary for Finney as we have seen] existed in the divine reason from eternity, and it demanded He take the very course He has taken in all His actions. The highest glory and the highest good of the universe demanded that He should consult His own discretion and exercise an absolute and universal sovereignty in the sense explained. The sovereignty of God is nothing else than His infinite love directed by infinite knowledge in such a manner as to secure the highest well-being of the universe that He can, but only in accordance with his foreknowledge of what man will do also. Finney says that perseverance is not on the basis of a regeneration that involves a change of nature, but regeneration is a voluntary change and is based on man’s own perseverance. Yet God has predestined it based upon His knowledge of man’s perseverance and ability and willingness to make that voluntary change. Finney says that because he does not believe in a final perseverance based upon the nature of the first act of faith, as many do, that he cannot infer the final salvation of the saints from the nature of justification. He has endeavored to refute this kind of a one-time justification by faith. We must not, he says, conclude that all saints will be saved from the mere fact that they have once believed and been justified [remember his doctrine of justification here – he believes in a justification based not upon faith but upon entire sanctification]. Further, Finney argues that God does draw men effecutally but not irresistibly. No one comes to God until effectually persuaded to do so. The sinner is effectually hunted from his refuge of lies, and he is drawn with so great and powerful a drawing, as not to force him, but to overcome his reluctance or voluntary selfishness. Thus, man is induced to turn to God and believe in Christ – induced to come to God by his own power. Yes, the sinner’s turning, so states Finney, is till an act of his own, but he is induced to turn by the drawings of the Holy Spirit. Thus, the Spirit by means of truth and argument and persuasion fairly overcomes the sinner and constrains him – not forces him to submit, for the final decision is in the hands of man and not by the overcoming power of God. Finney says the same is true of perseverance in holiness – in every instance and in every act the saints’ perseverance is not by virtue of a constitutional change, but as a result of the abiding and indwelling influence of the Holy Spirit. The will never obeys in any instance for one moment, except as it has been influenced by and persuaded to do so by the Spirit. No saint can convert himself, but at the same time the Holy Spirit cannot convert the saint without the saint’s agreement. God converts sinners in the sense that He effectually draws or persuades them and they turn themselves in the sense that their turning is their own act. The same is true of their whole course of obedience as a Christian. The saints keep themselves in the sense that all obedience is their own, and all their piety consists in their own voluntary obedience. But God keeps them in the sense that in every instance and at every moment of obedience, He persuades and enlightens them, insomuch that He secures their voluntary obedience. He draws and they follow. He persuades and they yield to His persuasion. He works in them to will and to do, and they will and do. But then there is always the other side, that the final work of salvation is only possible as man turns and converts himself. One must remember that it was [is] upon the condition of foreseen faith, that God could by the wisest administration of His government secure this result – the salvation of the elect. All is still based on God’s foreknowledge of man’s action and response, not by God’s power – a foreknowledge that men would believe and a foreknowledge that men would persevere – these are elected and ordained to salvation. Read the next paragraph to see the fullness of what Finney believes. Finney says that salvation can be accomplished only by the appropriate means or upon certain conditions, and these conditions include the perfect holiness of moral agents. God, therefore, does not affirm His ability to save all men, but He fully disclaims any such ability and professes to do and to be doing all that He can to save them – that is He does for men all that He wisely can do, and He does enough to secure their salvation – if they will only cooperate. God wills the salvation of all men only in the sense of desiring their salvation – He nowhere intimates a willingness in the sense of a design or intention to save all men, but on the contrary, He plainly reveals an opposite purpose. He reveals the fact that he cannot, shall not, does not expect or design to save all men – He only desires to save all men if He wisely can do so. The Father has given a certain number to Christ with the express design to secure their salvation—and He has committed to Him all the requisite power and influences to save them, and they will actually be saved – [those whom God foreknew would cooperate to be saved]. These are the ones that Finney calls the elect, and they all will persevere and be saved. Finney says again that perseverance to the end is often mentioned and insisted upon in the Bible, as a condition of salvation, and it is true and to be noted that without watchfulness and perseverance salvation is impossible. It is also true that the truly regenerate cannot sin in the sense of living in anything like habitual sin, because with all truly regenerate souls, holiness is at the least the rule and sin is the exception. Finney says it is correct to say that the truly regenerated so seldom sins, that in strong language it may be said that they do not sin and that perseverance [a perfect perseverance] is an unfailing attribute of Christian character. Thus, Finney again adds to the doctrine of perseverance the fact of perfection or entire sanctification, as he calls it elsewhere. If one is not living in a state of entire sanctification, then one is not persevering. He says that to understand the passages of the Bible on this subject, it is true to say that no truly regenerate soul does at any time sin and that holiness [his definition again of perfection] is the rule of the regenerate person’s life and sin the exception. There is no hope of anyone persevering except in so far as free grace anticipates and secures the concurrence of a man’s free will. Finney claims to believe in effectual calling, but again he redefines it, as he does so many other doctrines, to mean a calling that can be resisted still by man. Thus, in every aspect of Finney’s theology, man is central, and man is the power of salvation. God is only the one who seeks to convince and effectually call man [Finney’s definition of calling]. God never calls men by an irresistible call—He doesn’t have to for man is capable to respond to God by faith by his own strength and power. Man has the strength, and man only needs to decide to activate his will, as God stands alongside and waits for him to do so. Of course, God knows who will and who won’t, but there is no more that God can or will do to bring men to salvation, except to be a bystander and cheerleader, urging men on to make the right decision. Again, at its best, Finney’s theology is not even a good synergism, but it is a monergism from the standpoint of salvation being in the hands and power and will of man and man alone. Hence, therefore, a man who tells me, You must be so and so, in order to be saved, robs the cross of all its glory, and robs me of all my peace. If salvation depends upon our being or doing aught, we shall inevitably be lost. Thank God, it does not; for the great fundamental principle of the gospel is, that God is all; man is nothing. It is not a mixture of God and man,—it is all of God. The peace of the gospel does not repose in part on Christ’s work and in part on man’s work; it reposes wholly on Christ’s work, because that work is perfect—perfect forever; and renders all who put their trust in it as perfect as itself. nothing to do with it; if it be Sarah, man has nothing to do with it. Thus it stands throughout. The law addresses man, tests him, sees what he is really worth, proves him a ruin, and puts him under the curse; and not only puts him under it, but keeps him there, so long as he is occupied with it—so long as he is alive. “The law hath dominion over a man as long as he liveth;” but when he is dead, its dominion necessarily ceases, so far as he is concerned, though it still remains in full force to curse every living man. 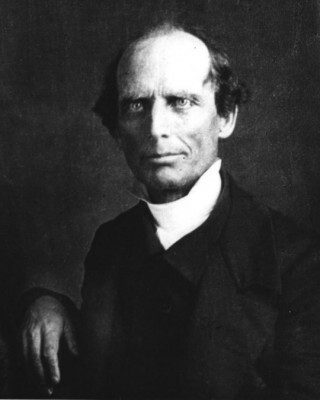 We will leave it to our readers to apply the proper words of Scripture to the life and ministry of Charles G. Finney, as far as his spiritual state, in light of his theology! Surely, though it be sad but true, there is no doubt about this matter, according to the Word of God!